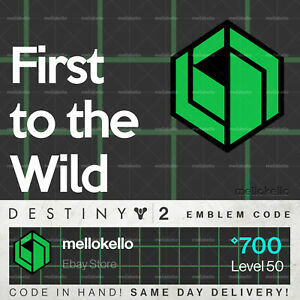 Destiny 2 FIRST TO THE WILD Emblem Code | CODE IN HAND! mellokello has no other items for sale. Details about Destiny 2 First to the Wild emblem IN HAND!! SAME DAY DELIVERY!!! Destiny 2 First to the Wild emblem IN HAND!! SAME DAY DELIVERY!!! Perfect, as usual. Super fast delivery. Great seller, would definitely purchase from again!